Zach Morgenstern is a second-year law student at McGill. He graduated with a Hon. BSc. in Peace, Conflict and Justice Studies and Ecology & Evolutionary Biology from the University of Toronto. His extra-curricular explorations have led him to participate in, and occasionally explore, environmental issues via campus journalism, community radio, and the Toronto and Montréal folk music scenes. Since 2012 one of the defining battles on McGill campus has been the dispute between activist group Divest McGill and the school’s administration over whether McGill should withdraw of its investments in the world’s 200 biggest fossil fuel producers. McGill has twice explicitly refused to divest. A 2016 report from McGill’s Committee on Matters of Social Responsibility accepted many of the premises of the divest movement’s position, before ultimately arguing, amongst other things, that “[w]hile there is widespread agreement that a transition to a new energy system is needed, it is foreseen that the transition must be orderly”. The fear of McGill administrators that divestment is “disorderly” was repeated at a recent Student Board of Governors Forum. After members of Divest McGill presented on behalf of their campaign, an audience member asked whether the board’s adopting investment policies in response to student activism amounted to a reckless turn to “populism”. The seeming sense of McGill administrators that divestment is a reckless demand of student mobs seems a bit of a misjudgement when one considers that divestment is being considered by political actors with even higher profiles than McGill. 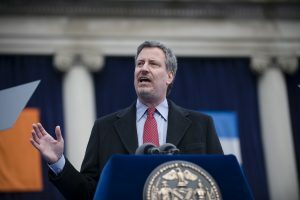 Earlier this year, New York mayor Bill de Blasio announced that the city will withdraw $5 billion worth of investment spread between 100 fossil fuel companies within five years. In addition, de Blasio announced a lawsuit targeting Americas’s five largest fossil fuel companies: BP, Chevron, ConocoPhillips, Exxon Mobil and Royal Dutch Shell. This lawsuit is consistent with a sort of circular logic that divestment activists have long championed. The theory of the carbon bubble states that so long as climate change continues to take its toll and some form of green change is pursued, then the present value of oil is bound to depreciate. Therefore it is good investment policy to withdraw one’s fossil fuel investments before their value inevitably drops. New York’s coupling of divestment and a lawsuit takes the logic of the carbon bubble a step further: not only is the city divesting based on the understanding that their assets will be worth less over time, but they are actively creating the conditions for their assets to be worth less over time. New York can thus be said to be standing up to the “divestment is anarchy” myth in a number of key ways. As stated, New York is boldly thrusting itself towards “anarchy” by using the courts to undermine the very institutions it has financially relied upon until recently, in defiance of Exxon’s claim that it’s wrong to use “trial attorneys against an industry that provides products we all rely upon”. New York has simultaneously, however, used its rhetoric to undermine the notion that divestment is a ham-fisted policy. City Comptroller Scott Stringer explains “[Divestment] will take time, and there are going to be many steps. But we’re breaking new ground, and we are committed to forging a path forward while remaining laser-focused on our role as fiduciaries to the Systems and beneficiaries we serve.” Perhaps most importantly, New York has reminded us that no matter how “anarchic” divestment may seem, the anarchy of climate change is far worse. As de Blasio put it “Sandy taught us how destructive weather events exacerbated by climate change can be.” 44 New York City deaths have been attributed to the hurricane. 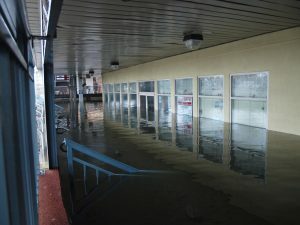 Sandy also caused substantial property damage, and a study by Madajewic and Coirolo found that it was not New York’s poorest, but middle-class homeowners who suffered the most economic losses in the wake of the storm a sign of the true unpredictability of climate change’s destructive potential. This is not to mention the potential financial anarchy that will result from non-divestment. In 2015, Bank of England Governor Mark Carney warned that leaving the carbon bubble unaddressed would create market risk comparable to the subprime mortgage crisis of 2007. New York’s policy is, of course, brand new so there is little as of yet to say as to its effectiveness. That said, New York is clearly not alone in seeing divestment as sound policy. Norges Bank, the manager of Norway’s Sovereign wealth fund, has called for the fund to be fully divested from oil and gas as they fear a permanent drop in oil prices. The World Bank has stated it will no longer fund upstream oil and gas development, making exceptions only when their funding will go towards developing countries AND does not contradict the Paris Climate agreement. Will McGill get good financial results from divesting? Will it make or at very least contribute to a permanent dent in the carbon economy? There are arguments on both sides, however, as leading voices continue to line up and lend credibility to the divestment movement, its disappointing to say the least that McGill has not adopted the morally courageous (“standing up for future generations”) tone of de Blasio and is instead invoking the dangerous, business-as-usual cautiousness of Exxon Mobil. 1 Sherbin, Alex De & Guillem Bardy. “Social vulnerability to floods in two coastal megacities: New York City and Mumbai” (2016) 1 Vienna Yearbook of Population Research 131 at 136, online: <http://www.austriaca.at/0xc1aa5576_0x00344f51.pdf>. Published by MJSDL on March 22, 2018 at 7:02 pm under Uncategorized. Ontario: The Next Battleground for Carbon Taxation?